If you clicked on this article, I am assuming you know what NRC DTAPP is or at least know not to confuse it with a sneeze or symptoms of a cold. Neither should NRC DTAPP be confused with the DTaP vaccine for diptheria, tetanus, pertussis but the convoluted mass of acronyms used makes it seem just as painful. Canada’s National Research Council (NRC) Digital Technology Adoption Pilot Program or DTAPP program is about supporting Canadian firms on the path to becoming more competitive globally using digital technologies. So what types of digital technology does the DTAPP program actually cover? The simple answer is anything that would support productivity to make a firm more competitive. What is productivity? It likely is not going to include anything on the front end of business operations like how to keep up on your emails or apps that make you as an individual more productive. The types of technology that NRC is going to support are more those that will support manufacturing and business systems either in the front office or on the plant floor so companies can compete globally and create more technology jobs. Do we know exactly what NRC means by digital technology? Well, not really. But we can make some educated guesses based on those technologies that we know have made an impact on productivity for companies in other parts of the world. What will NRC DTAPP support? Business systems. The default seems to be jumping to implementing enterprise resource planning or ERP systems though it would be expected that business systems could also include MRP, production planning and financial systems. It depends on the size of the company, the complexity of their systems and what makes sense for them to implement first given their need and resources available. Design and engineering system. Productivity for design and engineering would include tools that support rapid prototyping, design and drawing systems like CAD, PLM, modelling, simulation and collaboration tools. Supply Chain and Logistics. The systems to support productivity in supply chain could include in warehouse systems (warehouse management), inventory and asset tracking and location (bar code, RFID, GPS also known as auto-ID) – or software and hardware that would involve end-to-end planning for parts, suppliers and equipment in transit, in the warehouse or in the yard. Plant Systems. This would include anything that would boost value added per employee in manufacturing. It might be a robotic automation system, process control, sensor (M2M) or vision systems. I would expect the DTAPP program could also include plant networks and IT systems that support productivity. It’s unlikely that I have captured all of the types of technology that make sense for Canadian firms to adopt or that NRC would support. The main point is to determine what the main business constraint is. What is it that keeps the company from optimal productivity performance and from competing globally as a world-class firm? Canadian firms that are eligible to receive DTAPP assistance are small to medium size enterprises with 500 employees or less. We know that the program will not cover the costs of equipment or software but may include training and implementation costs. 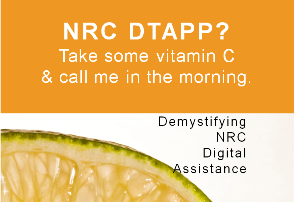 BLOG UPDATE: The NRC DTAPP program was suspended in March 2014. However, NRC continues to work to support Digital Technology Adoption Resources. While funding directly through DTAPP is not available, we encourage companies to contact their local ITA to learn more about productivity resources for Canadian firms. Terry Rachwalski is a BC business advisor In Canada who works with technology firms. You can follow her on Google +.